Jose Manuel Durao Barroso, president of the European Commission, and the ministers of Culture of the European Union attended the launch of Europeana in Brussels, Belgium. EFE/Oliver Hostel. LAST MINUTE NEWS/ BRUSSELS.- On the first day of its launch (20 November 2008), Europe's digital library Europeana was overwhelmed by the interest shown by millions of users in this new project. On the basis of expert advice, Europeana had anticipated up to 5 million hits per hour on the site. The real interest was 3 times as strong. This massive interest slowed down the service so much that after having already doubled server capacity yesterday at noon, the Europeana management in The Hague (Netherlands) and the European Commission last night had to temporarily take down the site to take pressure off it. This is an unexpected difficulty, but it is also an encouraging sign that citizens in Europe and around the world have great interest in Europe's digital library. It also provides strong motivation for the Europeana team and the experts from the Commission working on the project to intensify their efforts and the site's technical back-up even further. Europeana must now be made more robust to deal with peak hour requests as they happened yesterday  thousands of users searching in the very same second for famous cultural works like the Mona Lisa or books from Kafka, Cervantes or James Joyce. The European Commission and the experts from the Europeana project are working on this day and night to make a fully functional Europeana service available as soon as possible. The Commission and the Europeana management are confident that Europeana will be up and running again by mid-December. For the time being, a demo version of Europeana will be available at http://dev.europeana.eu/. The site was down because of massive interest, which shows the enormous potential of Europeana for bringing cultural treasures from Europes cultural institutions to the wide public. The 3 servers employed to support Europeana in The Netherlands could not cope with the traffic of around 10 million hits per hour (3,000 concurrent users  users doing the same thing at the exact same time), which led to the slowing down or the temporary unavailability of Europeana on Thursday, 20 November. The site went down several times (for periods lasting from a few minutes to an hour). It was slow throughout the day. Some users experienced more inconvenience than others, because of a load balancing issue (the way the traffic is handled by one server or another) between the 3 servers. The traffic increased in the afternoon and reached 13 million hits per hour (4,000 concurrent users). The most interest came from Germany, France, Spain, Italy and The Netherlands. 4% came also from the United States. Great interest among European citizens for this early operational version of Europeana was expected by the Europeana management, but not to such a massive extent. To make a comparison: over a period of 4 hours, the site was visited by more individual users and hits than the previous web service 'The European Library' run by the national libraries, in a whole year. Stress tests were carried out on the site, and it performed well at levels of up to 5 million hits per hour, a figure based on expert advice. After the site went down for the first time at about 11.00 hrs on Thursday, 20 November, the Europeana management in The Hague managed to increase computer capacity to deal with 8 million hits per hour (3 million more than what IT experts had foreseen and who had tested the site). This helped for a while, but did not prove to be enough. A serious upgrade of computer capacity will be carried out in the coming days and then tested in order to cope with the massive interest from the public. The Commission stayed in close touch with the management of Europeana throughout yesterday and during the night. Last night it concluded with Europeana's management that it would be better to close the site at the moment and come back when the teething problems, particularly the capacity issue, are ironed out. This decision was implemented early on Friday, 21 November. Users can expect the Europeana site to work normally by mid-December. BRUSSELS.- The president of the European Commission, Jose Manuel Durao Barroso, and the ministers of Culture of the European Union attended the launch of "Europeana" in Brussels, Belgium. Europeana, the Eurpean virtual museum offers from now on free access to more than two million books, paintings, videos and other digital documents from the cultural centers all over Europe. 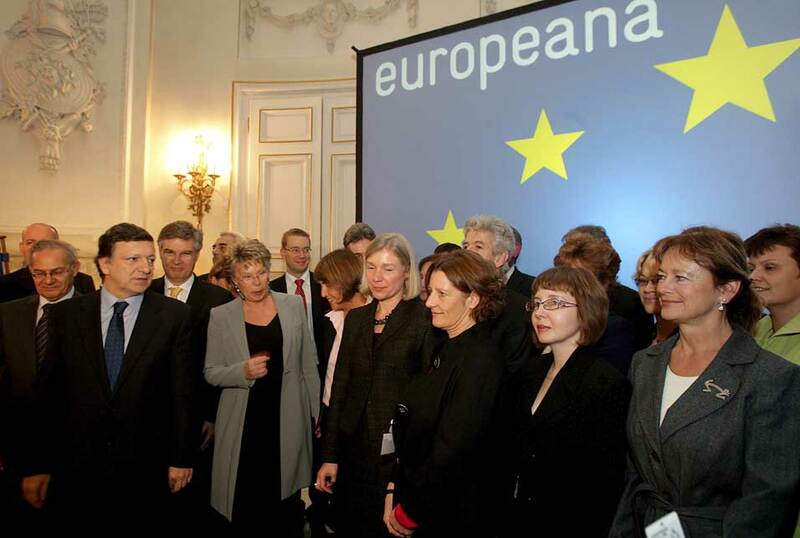 The idea for Europeana came from a letter to the Presidency of Council and to the Commission on 28 April 2005. Six Heads of State and Government suggested the creation of a virtual European library, aiming to make Europe's cultural and scientific resources accessible for all. On 30 September 2005 the European Commission published the i2010: communication on digital libraries, where it announced its strategy to promote and support the creation of a European digital library, as a strategic goal within the European Information Society i2010 Initiative, which aims to foster growth and jobs in the information society and media industries. The European Commission's goal for Europeana is to make European information resources easier to use in an online environment. It will build on Europe's rich heritage, combining multicultural and multilingual environments with technological advances and new business models. The European Commission's goal for Europeana is to make European information resources easier to use in an online environment. It will build on Europe's rich heritage, combining multicultural and multilingual environments with technological advances and new business models. The Europeana prototype is the result of a 2-year project that began in July 2007. Europeana.eu went live on 20 November 2008, launched by Viviane Reding, European Commissioner for Information Society and Media. Europeana is a Thematic Network funded by the European Commission under the eContentplus programme, as part of the i2010 policy. Originally known as the European digital library network  EDLnet  it is a partnership of 100 representatives of heritage and knowledge organisations and IT experts from throughout Europe. They contribute to the Work Packages that are solving the technical and usability issues. The project is run by a core team based in the national library of the Netherlands, the Koninklijke Bibliotheek. It builds on the project management and technical expertise developed by The European Library, which is a service of the Conference of European National Librarians.